Appointments are generally scheduled on Mondays, Tuesdays, Thursdays,and Fridays. Evening appointments are available and new patients are welcome. A receptionist is usually available to schedule appointments after 8:00 a.m. on the days we are open and can be called at (231) 773-3258. 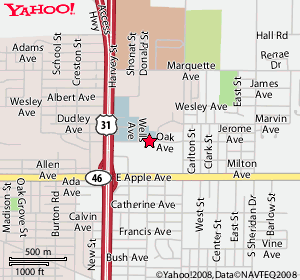 We are located behind the Muskegon General Campus of Mercy Health Partners, near US 31 and Apple Avenue in Muskegon, Michigan. If coming from US 31, exit on Apple Avenue and go east. Turn left at Harvey. Turn right at Oak Avenue (just prior to the hospital, driving along the parking lot). After the hospital parking lot there will be rows of medical offices. We are at 1762 Oak, the first medical office in the first row behind the Hospital/Birthing Center parking lot. Your first office visit will generally be longer than usual office visits so that we can obtain a complete medical history and perform an initial physical examination. Subsequent office calls will usually take less time (and will carry a lower charge). Please bring your insurance cards and bring all medications you are taking (both prescription and over-the-counter) in their original containers to your first appointment. If you will be needing refills for controlled substances, you should arrange to have your records sent to us prior to your first appointment. Records can be mailed, or can be faxed to (231) 773-4776. It is our goal to see you promptly at the time of your appointment. Unfortunately there is always the risk of falling behind due to an emergency or because of having to devote more time than was scheduled for certain medical problems. Be assured that when it is your turn to be seen, you will receive the same high quality of health care. If you are concerned about the possibility of having to wait, you can call the office before leaving home to better determine what time we will be able to see you. After office hours, Dr. Chusid can be contacted by calling our after hours number: (231) 737-5719. Please note that this number is for urgent matters only, not for prescription refills or to obtain test results. In case of emergencies, call 911. Routine prescription refills are generally sent electronically to your pharmacy. Should you need a refill on a long term medication, call your pharmacy and they will send a request to us for the refill. We recommend requesting refills two business days before they are needed in case we need to contact you before the refill is authorized. Refills for controlled substances should be requested at the time of your appointment. Calls for refills should only be made during regular office hours and not over the after hours line. Wellness/Preventive Exams (now covered by Medicare and many insurance plans annually). Many primary care doctors will care for you in the office but refer you to a different doctor should you require hospitalization. An internal medicine specialist is able to care for you both in the office and in the hospital. A physician who is familiar with you and your medical history can provide more comprehensive care for your medical problems before, during, and after any needed hospitalizations. We also prefer to offer preventive care to intervene in potential medical conditions before they cause serious problems. While we practice all areas of Internal Medicine, our office concentrates on the intensive treatment of Diabetic patients. There is a particular need for modern, state of the art diabetic care in the Muskegon area as it leads the nation in complications of diabetes such as heart attacks, end stage renal failure, and leg amputations. Intensive treatment can help to reduce the incidence of these complications of diabetes. To help make medical care more convenient for our patients, we perform many of the diagnostic tests necessary for comprehensive medical care within our office. Performing many diagnostic studies in the office can greatly reduce the time between when the patient is seen and results are available for our review, allowing us to more rapidly make changes when tests indicate a need for changes in treatment. Often test results are available at the time a patient is seen in the office. We perform some laboratory testing, tests on the heart including EKG’s, tests to evaluate lung problems, and tests to evaluate nerve damage from diabetes.